Seeing Things. Again. And *sigh* Again. As I’ve written in previous posts, hallucinations are kind of a normal thing for me. Ever since experiencing high fevers as a child, I’ve seen and heard things that I later learned weren’t real. Or, at least that’s true of much of what I hallucinate, but other times I’m not so sure. For example, I’m willing (eager!) to believe that the black, hairy spiders the size of dinner plates streaming down my bedroom walls in the first light of dawn are mere illusion. Since I’m in a transitional, hypnopompic state when I see them, I’m completely paralyzed in bed and at their mercy. If they were real, they could easily wrap me in silk and snack on me at their leisure. The fact that they fade from view as soon as I’m able to move again is reassuring, so I’ve learned not to be too fussed when I see them. They’re just the figments of a wandering brain. But I’ve had other hallucinations, particularly of the auditory sort , that were frightening. There’s been at least one that I’m certain was caused not by me, but by some outside, malevolent force. Thankfully, that kind is very rare. But despite my history of life in the illusory lane, no hallucination I’d ever experienced—harmless or otherwise—prepared me for what happened when Glen and I moved into our “forever home” in February 2017. Soon after we set up the larger furnishings in the new house, Glen moved the rest of the boxes and smaller items into the garage. 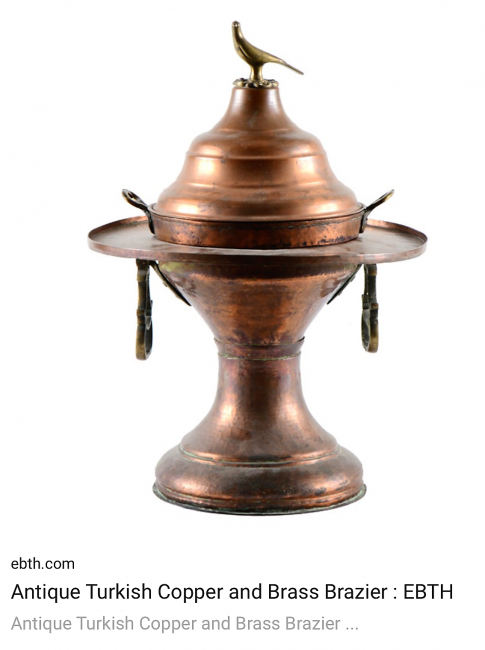 Among them I noticed one of my favorite pieces, an antique brazier that my mother had bought when I was a little girl. 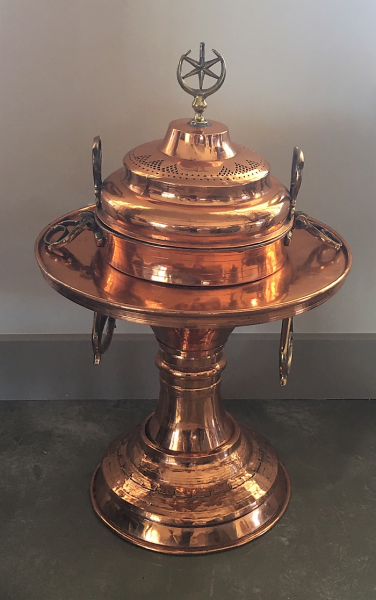 She passed it on to me many years ago, and I probably ruined its value as an antique by promptly having it polished and lacquered to preserve the copper finish. She’d always told me it was Persian, but after seeing this similar Turkish one pictured below, I have my doubts. In any case, I’ve always treasured it, and I wanted to find a good place for it in the forever home. And every day when I saw it in the garage amidst all those unpacked boxes, I felt guilty that I hadn’t. Then one day last April, I went in the garage to fetch something. Again I looked toward the brazier, angry and upset with myself for having neglected it. (Yes, I tend to anthropomorphize inanimate objects.) Instead, there was an empty spot on the concrete floor where the brazier had stood for weeks. I turned the house inside out looking for it. I searched every room, every closet, every dim corner of the attic. So did Glen, and so did Katie when she visited soon after. Nothing. I grew increasingly upset over the next few months, unable to account for its disappearance. The Husband and The Daughter both reassured me that it would turn up, and Glen even suggested it must be packed away in a moving box. I dismissed that ridiculous theory out of hand. How could it be in a box? I’d seen it every day for six weeks running! Hunh. What do you know? Glen and Katie were right . . . again. That was two months ago. Now that much of the astonishment has worn off, the first thing that strikes me about this latest hallucination is that the duration alone makes it highly unusual. But there’s something else about it that I can’t put my finger on. As if it wasn’t the product of an annoying trickster brain, but originated instead from something outside of my own psyche. As if something—or someone—asked for my attention. It’s just speculation for which I’ll probably never have an answer, and I suppose it doesn’t matter. The happy outcome is that the brazier was never lost. Thank heavens. 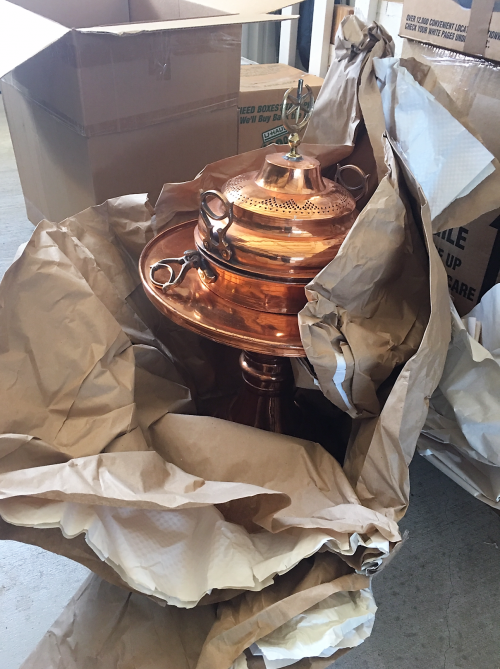 Welcome to your new home, brazier. It’s good to see you. For real, this time. Pffffft. Amateurs. I could tell them a few things about experiencing sounds.